This figure is stolen from Wedel et al. (2000:fig. 5). A shows the first 11 cervical vertebrae* of Sauroposeidon in articulation. B shows how the holotype specimen, OMNH 53062, must have disarticulated, and C shows it as it was found. Shaded vertebrae and bits of vertebrae were not found. The thickness of the cervical ribs is greatly exaggerated for clarity. *We assume that Sauroposeidon had 13 cervicals like Brachiosaurus. It is not beyond the bounds of possibility that it had more, but it is unlikely that it had fewer. Sauroposeidon seems to be all about crazy neck elongation, and it doesn’t make sense to make some vertebrae longer while losing others. In life, the long cervical ribs formed overlapping bundles, just like the long neck tendons of birds, and that is how the preserved cervical ribs are arrayed–in vertically stacked bundles. Each cervical rib is about 4 cm in diameter where it attaches to its vertebra, and tapers to a point about 3 meters away. The last meter or so of each rib goes from being the diameter of a pencil to the diameter of a mechanical pencil lead. They just sort of peter out into nothingness. The fact that even the pencil-lead-sized wisps of the cervical ribs are still in articulation suggests pretty strongly that the neck was buried with the muscles intact. If the neck had simply been broken transversely (like a guillotine cut), the two most anterior vertebrae in the preserved block of four should have the cervical ribs of even more anterior vertebrae beneath them, and the cervical ribs from the two most posterior vertebrae would not stick out the back of the preserved block. The facts that the cervical ribs from the missing anterior vertebrae are also missing, and that the cervical ribs from the preserved vertebrae trail behind the articulated block, suggest that the neck was pulled apart lengthwise, as shown in B. None of the vertebrae have any teeth marks or any sign of mechanical damage, other than the missing neural spine from the third preserved vertebra. The front third of the first preserved vertebra was eroded away before the vertebrae were discovered in the field. Assuming that Sauroposeidon was built like Brachiosaurus, it must have had a body mass somewhere between 40 and 60 tons. Even if it was built more like Mamenchisaurus—hellacious neck tacked on fairly dinky body–it was still probably a 20-ton critter. After 14 years of subsequent erosion and fieldwork, no other sauropod bones have been discovered at the site. How did the neck get separated from the body? The body was presumably too big to move, and the neck is too well preserved to have been moved very far. What pulled the neck apart? How did the neck come apart without disturbing those little pencil-lead cervical rib ends? I don’t know the answers to those questions, by the way. And I’m open to suggestions. Here’s my best guess. I think the body stayed put, and the neck floated away. Not far–a few hundred feet would be enough to put the body outside the outcrop area at the holotype site, but not so far that the neck would be all beat up. I think it floated rather than being dragged (by an Acrocanthosaurus, for example) because the vertebrae are all in such good shape and none of them have any tooth marks. I think it floated in calm water because the preservation is so good. I think the neck muscles rotted enough to let the force of the current rip part of the neck away from the base, just like you can pull a cooked chicken neck apart lengthwise without messing up the articulations among the vertebrae in the chunk that breaks free. All of that will suffice to get the neck separated from the body. What really bugs me is the separation of the anterior part of the neck from the preserved block of vertebrae. It is tempting to think that the anterior part never came off, and that those vertebrae simply eroded away before they were found, like the front third of the most anterior preserved vert. But that can’t be; if those vertebrae were in articulation and just eroded away, we should still have their cervical ribs below the first two preserved verts. It is worth noting that there are probably only a handful of people alive who have any first-hand experience with how multi-ton animal carcasses are dispersed, and zero people alive who have ever seen a dead sauropod rot. So, like too much in paleontology, what seems plausible or reasonable to me may not line up with objective reality. Comments, suggestions, hypotheses, rants, and crank fringe theories welcome. Wedel, M.J., Cifelli, R.L., and Sanders, R.K. 2000. 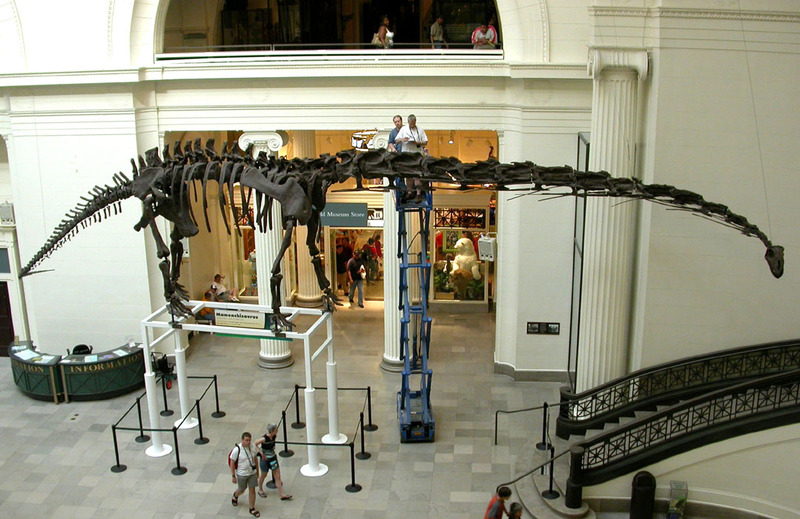 Osteology, paleobiology, and relationships of the sauropod dinosaur Sauroposeidon. Acta Palaeontologica Polonica 45(4):343-388. My daughter would argue that when the crocosaurus bit its head off, the teeth marks were in the bits that it ate. All the thrashing about busted the rest of the specimen loose from the body. Me, I’ll cite blast damage from when the head detonated. Question on the Mamenchisaurus photo: do the bones and muscle attachments allow for the possibility that it may have had a snake-like or eel-like locomotion in water? Not necessarily identical to a snake, but just any sort of undulatory locomotion not dependent on quadrupedal ground walking. I’m thinking about seasonal deluges, say dry ground for 9 months but 3 months of flooding. Some African savanna-deserts are like that, and perhaps the ancient Mongolian Gobi desert was also. 4 relatively short legs but a long neck might allow walking/standing on the bottom while breathing/eating above water. Probably just a bored dinosaurid anatomist messing with us. ..and crank fringe theories welcome..
How about ‘occasional time spent solitary and clothes-free outdoors throughout life can have significant mental health benefits’? Okay… I propose that decomposition of this carcass commenced from the head end (possibly explosively severed) and that the intervertebral discs thus rotted sequentially, likely swelling with internal pressure. I further propose that – for each such disc – at a certain critical stage of its decomposition (but not before or after) its envelope was liable to rupture explosively… its internal gel, ignite. So what happened was this. Rotting of the carcass progressed caudally from the head till the disc (at the anterior end of the neck section found) was ‘critical’, at which point its detonation was triggered somehow (it could have been a particularly hot day, or a particularly hard tug from a bone-picking scavenger, that did it). This was a ‘soft’ explosion, not a violently destructive one (more of a phut’ than a ‘bang’), sufficient only to break the (beginning-to-be-putrid) connective tissue between these adjoining vertebrae while not breaking the wiry cervical ribs. The neck thereby lost structural integrity here, such that it could be parted longitudinally by random minor environmental forces (wind, tidal action, tugs of competing scavengers, earthquake). This separation thus opened a new ‘anterior’ surface across the neck, from which decomposition could again proceed posteriorly. It is easy to see that later something similar could happen, further caudally, thus isolating completely the (retrieved) section of neck. Um, some other stuff would have to happen too, which I leave for more experienced commentators to determine in detail. If a mega-predator (like an acrocanthosaur) were to try and carry off the decomposing neck by picking it up at the head end and pulling, it could be possible that the neck might come apart in the manner you suggest for a cooked chicken neck, maybe. The verts closest to the body might have stayed with the body, and the verts at the head end (which would be the only ones bearing tooth marks) would have been the ones that the predator took away. Since extant crocodilians reportedly sometimes stow their killed prey under submerged logs as a food stash, is there a likelihood extinct crocasaurs did similarly? Ambushing sauropods drinking, may they have grabbed them by the head/neck (to asphyxiate/ decapitate by death-rolling/ haul in to water)? And then either transport the carcass (or bits of it) away themselves, or (if crocasaur failed to retrieve it) leave it immersed, liable to breakup by decomposition and/or assorted nibblers, and subsequent water transport? Maybe several crocasaurs, tugging competitively at a rotting carcass…? I have to come clean: when I say “crocosaurus”, my daughter corrects me with “crocodilian”. My shame is complete. I’d say a flash flood killed the beast, tore it’s neck apart while still alive, and quickly buried it. oh. One more thing, the creature happened to be walking in about the same angle and direction as the water that tore it apart so as it fell forward the neck was numero uno to go.